Jhye Richardson wants to follow in the footsteps of Dale Steyn and prove that not all fast bowlers have to be giants with long arms. And as far as starts go, Thursday wasn't a bad one at the Gabba. 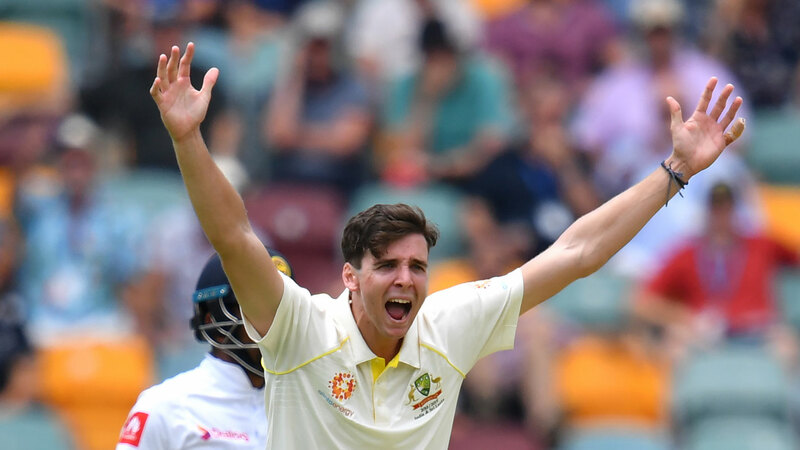 Richardson claimed figures of 3-26 on debut against Sri Lanka in the pink-ball Test, picking up the two big wickets of Kusal Mendis and Dinesh Chandimal as he swung the ball more than any other Aussie this summer. It carried on an incredible summer for the 22-year-old, who also knocked over Virat Kohli in all three of the one-dayers against India. But the one thing fans have kept noticing in Richardson's early international career in both the limited-overs and Test formats is that he's not that tall. According to official figures, Richardson measures up at 178cm, just one centimetre shy of South Africa's legendary quick Steyn. "My big one (I grew up idolising and modelling off) was Dale Steyn. Similar sort of build, the untraditional fast bowler, quite skinny and not as tall as everyone else," he said. "He proved that he could be a class bowler with that sort of build and bowl at extreme pace. Breaking the stereotype of fast bowlers is what I've been trying to do." And it didn't take long for Steyn to find out about the admiration the Aussie had for his fellow quick, posting to Twitter that he's "100% a fan". What Richardson has in his favour is a simple but whippy action that generates pace and a no-fuss approach to his bowling. He admitted to feeling anxious when told he'd play on match eve, but none of that showed against the Sri Lankans. And if he ever lost his head, he knew exactly where to look to remember to stick to his calm approach to the game: His boots. "I've just written a little message on my boots that I used last year in a Sheffield Shield which says KISS - Keep it simple stupid," Richardson said. "Then I've written ruthless as well just to remind myself that I need to get into the contest, bowl aggressively and put my heart on the line."